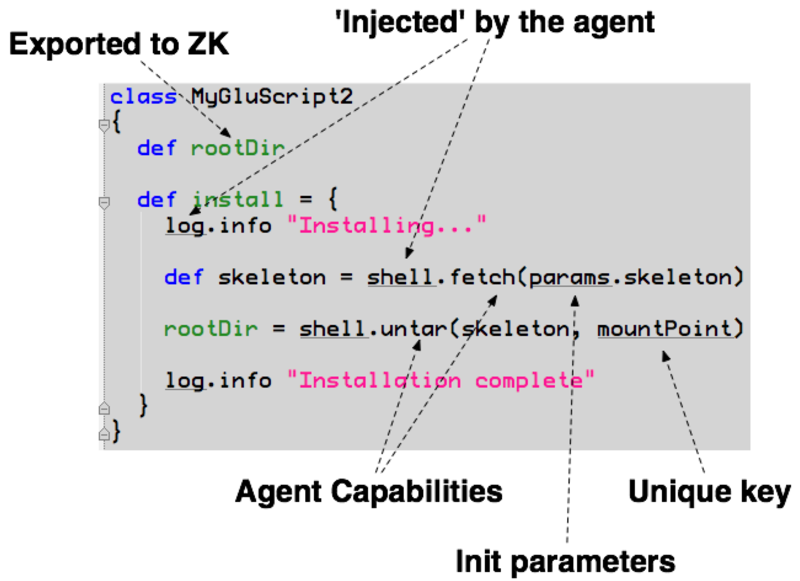 A glu script is a set of instructions backed by a state machine that the agent knows how to run. In general, and by default, a glu script represents the set of instructions which defines the lifecycle of what it means to install, configure, start, stop, unconfigure and uninstall an application. A glu script is a groovy class which contains a set of closures where the name of each closure matches the name of the actions defined in the state machine. This example shows the default closure names. The script can also store state in attributes (like port and pid in this example). The code of each closure can be any arbitrary groovy/java code but remember that the agent offers some capabilities to help you in writing more concise code. This is how the default state machine is defined. If an action is empty you don’t even have to define its equivalent action but you still need to call all prior actions to satisfy the state machine. This section is for advanced users only. You can safely skip it and come back later if you feel like you need to change the default state machine. In the event when the default state machine does not match your needs, you can define your own (system wide) state machine and configure glu to use it. See the section on how to configure a different state machine. You will need to configure the console (UI) to display your own actions if you want to. Check the Plans and MountPoint actions sections for more details. In addition to your own state machine you can also use the plugin hook PlannerService_pre_computePlans to define your own custom actions! As described in the section Capabilities, a glu script can use all the capabilities provided by the agent. Implicitely (at runtime), all glu scripts implement the GluScript interface. This closure must return the actual script to use. In its simplest form, the closure does nothing besides returning the script itself untouched. In order to be able to see (in the console) log files produced by an application deployed by the glu script, you can follow the convention described in the “Log Files Display” section. In order to be able to see (in the console) processes managed by the glu script, you can follow the convention described in the “Processes Display” section. All fields in a glu script are stored (locally on the agent) and exported (remotely to ZooKeeper). Check the “Integration with ZooKeeper” section. You can find a real life example of a glu script called JettyGluScript which shows how to deploy a webapp container (jetty), install web applications in it and monitor it. You can use maven or any other dependency management system as long you include the proper dependencies. Every classpath element (cp) being a query string paramater must be properly URL encoded! all attributes defined in the base script will automatically be exported to ZooKeeper as if they were defined in the subclass! since glu uses closures (and not methods), you cannot override a lifecycle method. Instead you should use a technique similar to the example in which the base class defines a closure (baseConfigure) that gets called directly by the subclass.